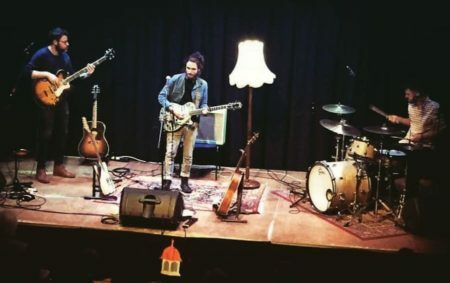 Five dates into his tour and Blair Dunlop’s tender throat is only just getting up to speed, while the simple comfort of having his mum’s standard lamp on stage with him – it’s the one on the cover of his latest album Notes From An Island if you’re wondering – is a helpful reminder of home. Perhaps. As for what happened to rock ‘n’ roll, it got corporate, distant and bland, and if Blair Dunlop is anywhere tonight he is a long, long way from corporate, distant and bland. The fact he is here at all, in front of a mere handful of souls ranging from the curious to the converted, is testament to just how far away he is from the manufactured, manicured, overly marketed world of 21st century rock ‘n’ roll. “I took my first steps on the Cobb, Meryl Streep wasn’t there though,” he shares, referring to the town’s iconic harbour wall made famous in the Karel Reisz film of John Fowles’ novel The French Lieutenant’s Woman and a reminder that he’s no stranger to life on the road – being the son of British folk guv’nor Ashley Hutchings and singer Judy Dunlop. All this chatter evinces the consummate ease with which Dunlop tackles his craft. He’s rarely lost for a tale to tell and yet his songs to do most of the talking for him, tackling the personal and the intimate with a clear social conscious and no small measure of ire. New album opener Spices from the East manages to explore what it is to be British today and presents a searing indictment of colonial perks while simultaneously celebrating the fine art of cooking. As expected he plays nearly all the new album. It’s his most accomplished, sophisticated work to date in which his writing, singing and musicianship all scale new heights, from the ansty confessional I Do and bare soul searching on Cobalt Blue, to the classy break up anthem Feng Shui and Sweet on You, a witty treatise in which he fancies the mother of the object of his affections because she likes Ry Cooder. Green Liquor tells of the housing crisis although the title is inspired by jellied eel sauce, the delicate Within My Citadel articulates self-preservation techniques, Threadbare picks apart a love affair and Nothing Good ostensibly bemoans the lack of decent telly. From his back pages he delivers the achingly beautiful eco hymn Up On Cragside and 45s, searing reportage from the frontline of nightlife. A word too for Jack Carty, the prodigiously engaging Australian singer songwriter whose Hospital Hill album recorded with a string quartet is a real treat – his opening solo set ably settles the audience before he completes Blair Dunlop’s band line up on bass with the unfussy percussive talents of Fred Claridge on the kit. Sterling work! The trio proves a gutsy and nimble setting for these songs as well as a Springsteen cover – Dancing in the Dark – that Blair learned en route to a radio session with Richard Madeley immediately after having left a meditation retreat with his mum. Apparently emptying your head of conscious thought is not the ideal preparation for learning songs by The Boss, especially one he only learned because the work of Jackson Browne, Van Morrison and Joni Mitchell was not considered popular enough for Radio 2. He says it’s his most requested song. Although not in Lyme Regis where an admirably polite handwritten request for Fifty Shades of Blue is made good in the first encore before, conscious of the need to preserve those vocal chords, Blair closes the night with a stunning solo instrumental take on the Burns tune Ye Banks and Braes O’ Bonnie Doon. Blair Dunlop has come a mighty long way since those first faltering steps taken on the Cobb and it’s a shame more weren’t there to see it because on this evidence his next steps will be giant leaps.